Declan tries to talk to Bridget but she gives him the brush off and heads straight outside towards Riley. Noticing that Josh has also come to see her, she plants a huge smooch on him to prove a point to Declan. Josh is pleased at first but then realises what the kiss was really about when Declan gives him a death stare. Karl is trying to boost Susan's spirits by telling her that there's an 80% chance her eyesight will return. He thinks that everything will be a lot better when she's able to see her family. But Susan wonders what they're supposed to do when the next attack happens – and the next. SUSAN: We'll never be able to relax. What kind of a life is that? KARL: It's our life. And we will make the most of every second. Dr. Vinton walks in to take off some of Susan's bandages, so Susan puts on a brave face. Now I know why we haven't seen #24 in a while... Kirsten has looted the joint! Harold's flower painting is on the wall, and who knows what else she's stolen. Anyway, the place looks like IKEA has exploded in it and Kirsten plays the hapless damsel card with Ned all, “Oh my, what's little old me supposed to do now?” Ned starts off well by saying that he's got to take a client's car back with Janae, but Kirsten soon guilts him into staying. Steph's reassuring Libby that Susan is just in shock at the moment and will want her family back with her soon – Steph was exactly the same when she found out about her cancer. Lib smiles through her tears and hugs Steph; she's so glad she's got someone to sook with! Steph wonders why Lib can't sook with Darren but Lib gives her a non-answer, as she's prone to do these days. 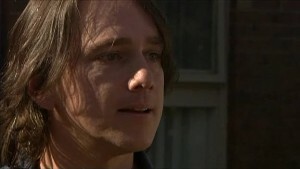 Ben walks in and asks if Libby's still upset about Nanna, and then wonders if she's crying over Darren again. Steph's ears prick up at this, but Lib quickly takes Ben into the lounge room to fix up a DVD for him. Susan still has some bandages on her hands but is relieved she can at least wiggle her fingers now. Karl brings in a visitor, which makes Susan uneasy, until she realises who it is. Susan hugs him and lovingly strokes his face. Karl looks on fondly as Toadie jokes around with Susan and gives her some much-needed chuckles. When Lib walks back in, Steph immediately pounces on her for more information about why she was crying over Darren. Lib tries to chalk it up to Ben's overactive imagination but Steph doesn't believe her. Realising that Steph won't stop till she gets some answers Libby ‘suddenly' realises she's late for an appointment at Erinsborough Primary and skedaddles out of there. Bridget motions to Riley to nick off so she can spend some time alone with Josh. But when they're alone, Josh asks her what all the public pashing was in aid of earlier. Bridget confesses it was for Declan's benefit, but only because she wanted to make it clear to him that Josh is her boyfriend. Josh is all, “Boyfriend?” when Steve and Miranda walk in. BRIDGET: Mum, Dad, this is Josh. My friend Josh. STEVE: (face falls) Oh... Josh is it? Handshakes and concerned looks all around. Jolly ho. It's taken Ned and Kirsten about ten years to put one table together, but Kirsten has used this time nicely to cosy up to Neddykins as much as she can and play ‘let's reminisce' about the good old Oakey school days. Ned finally clues in that he should get going, but Kirsten puts out her guilt bait again and reels in another sucker fish. In the words of Chandler Bing, could Ned BE anymore gullible? Steve and Miranda chat with Bridget and Josh, and Steve does his overprotective dad bit by pointing out that 17 (Josh's age) is a lot older than 16 (Bridget's age). Well... as Bridget correctly points out, it's a whole 12 months, dude. Get a grip. Over this parental chat, Bridget leads Josh away to listen to music in her bedroom. Once they're out of earshot, Miranda asks Steve what his problem is. MIRANDA: (disgusted) Oh my God, Steve, the things you say. Steve tetchily reminds her that 17-year-old boys are full of hormones, but Miranda thinks Josh is a charming chap. She also thinks that Bridget wouldn't let a boy anywhere near her. Joining them, Riley cheekily says that's not exactly true if the pash at school today was anything to go by. Steve immediately stands up to rush down the hall but Miranda orders him to sit down. MIRANDA: Tell you what. In fifteen minutes I'll go in there and offer them a snack and leave the door wide open. Janae approaches the front door and overhears Kirsten playfully chatting with Ned. He says that he should go but she convinces him to stay for a coffee and, bizarrely enough, a shower if he wants. Putting up two IKEA items really works up a sweat I guess. Janae makes herself known before things get worse and Kirsten looks very disappointed. Unimpressed, Janae tells Ned that their client has been waiting for them for ages and Ned quickly hightails it out of there. Kirsten ‘sweetly' says that it's her fault that Ned's late and Janae just gives her this look like, ‘Don't talk to me you moll'. Ben complains that the school trip was a waste of time because the office was closed when they got there, but Lib promises to take him tomorrow. Ben happily races out the door to tell Mickey, hilariously slamming the door on his way out. Checking the answering machine, Libby is annoyed to hear a message from Darren on there saying that he needs to talk to her. Karl arrives home just as Libby sourly erases it. Not realising the storm he's just walked in to, Karl tells her that Susan's okay. KARL: It's just so difficult to see her in so much pain. LIBBY: Really? Didn't seem to bother you in the past. LIBBY: (getting fired up) Well you made her life a living hell. First with Sarah then Izzy; why the conscience now? KARL: I beg your pardon? LIBBY: I'm just stating the facts, dad. KARL: Yeah, I'm very well aware of the facts, Libby. I'm also very well aware they're behind us. LIBBY: And now look what's ahead. Isn't it a shame things had to get this bad for you to finally give a damn? Karl is left utterly gobsmacked by his daughter's sudden vitriolic attack. Ben and Mickey are playing footy in the house with Steve until Miranda puts a stop to it. She tells her husband that he can relax – she just took in some cheese toasties to Bridget and Josh and all they're doing is talking. Steve whines some more so Miranda asks what his problem is. Steve says that they don't even know Josh, and that Bridget isn't ready for a serious relationship. Miranda retorts that Steve could always chat with Josh and get to know him – and isn't it up to Bridget to decide her relationship status? She's just relieved that Bridget is with someone who doesn't encourage her to be reckless. MIRANDA: Are you uncomfortable with Josh being in a wheelchair? STEVE: Are you only comfortable ‘cause he's in one? Hmm, food for thought... perhaps a cheese toastie. Libby wants to know if Karl is sorry for what he did to Susan, because she sure as hell doesn't know how he got away with everything. KARL: (incredulous) I didn't get away with anything, she forgave me, which is clearly more than you can do. KARL: (over her bizarre behaviour) Oh no, that's enough. LIBBY: (chases him to the door) Oh, what should I do? Should I just sit back and shut up? Is that how a woman should behave? Karl leaves and Libby bursts into tears. Janae is buying a present for their elderly client to apologise for their lateness. Ned says that he'll take all the blame and tries to reason with Janae that the sooner Kirsten has her own life set up, the sooner she'll be out of theirs. Janae admits that she's not angry with him, she's just jacked off with Kirsten's obvious game playing. The whole situation reminds her of what happened with Boyd... Ned's shocked that Janae feels this way and ruefully wraps her in a hug. NED: Look, you've got nothing to worry about, I swear. And thanks for being honest with me. It's not good to bottle things up. JANAE: Well, bottling is actually kind of rare for me so you should count yourself lucky. Darren Stark suddenly wanders in to buy a bouquet of flowers, surprising Harold in the process. 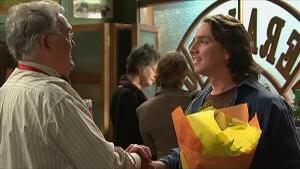 He's pleased to see him, but Darren doesn't think that Libby will feel the same way – that's why he's getting flowers to soften the blow. Harold can't see why Libby wouldn't be happy to have him here, but Darren's face tells a different story. Susan tells Karl that she wants to talk with Lib, but Karl is very quiet after his stoush with her. Dr. Vinton walks in to shine some light in Susan's eyes and check her vision. Susan's elated when she can see a small amount of light shine through on the outskirts. Pleased with her progress, Dr. Vinton tells Susan that she can go home the next day, which is very welcome news for Susan and Karl. Janae has decided to confront Kirsten about her game playing and asks outright if she's trying to win Ned back. Kirsten surprises Janae by admitting that she's still attracted to Ned, but she wouldn't do anything to jeopardise their relationship. Janae can't help wondering if Kirsten would make a move if she wasn't around. Smiling, Kirsten says she probably would. KIRSTEN: But as long as you are around that isn't going to happen. Miranda is waving Riley, Bridget and Josh off when Bridget gets a text from her dad – he wants them to meet him at the Vet Clinic so they can chat over some cake. Aww, he took Miranda's advice. Miranda joins Libby, who is checking her mail, and asks about Susan. Lib relays the latest news and then brings up the Oakey reunion. Miranda says that the Parker boys are excited but she's dreading it. LIBBY: (wistful) Well, have a beer for Drew. MIRANDA: Oh, we will. He'll be fondly remembered by many people. Speaking of people in Libby's life who begin with D, Darren pulls up and Miranda leaves them alone. Libby immediately barks at him to go home and that she doesn't want Ben to see him, but Darren looks very pained and says that he's not going anywhere. Libby defiantly tells Darren that she's going to call the police if he doesn't leave, but Darren says that he's not there to hurt her – he loves her. Libby wryly states that she knows what love is like and it's nothing like this. In the meantime, Karl has arrived home and is quite pleased to see Darren until he can hear them arguing. Darren tries to take the phone off Lib when she attempts to dial the police, so Karl steps in to see what's wrong. Darren sharply tells him to mind his own business, which sets off the protective papa bear vibe in Karl. A bit of scuffling ensues between the men until Lib tells them to break it up. She angrily stands next to Karl and has a stare-off with Darren.